What is a Pool Filter? Choosing the correct swimming pool filter will ensure your pool stays as healthy as possible. The purpose of the pool filter is the removal of debris so that algae and other harmful bacteria have as little chance of growth as possible. Selecting the correct pool filter will depend on your site suitability, size of your pool and budget. Luckily, your local Poolwerx can assist you in selecting the perfect pool filter and media for your swimming pool. A good pool filter will remove the dirt and other matter in the water to help reduce the growth of bacteria and keep your water clean. AstralPool have a range of filters to suit your requirements and your pool equipment. Not sure which filter you need, or suits your equipment? We can help, simply call your nearest Poolwerx. The Viron QL cartridge filter will give you outstanding reliability and performance for your swimming pool or spa. This cartridge filtration system is finer than a sand or glass media filter and reduces cleaning frequency saving you precious time. Compact in design, the ZX cartridge does not require a back washing line so they are ideal for places or situation where wastewater disposal or water restrictions are in force. With the use of antimicrobial elements your pool or spa will be bacteria free and require less maintenance. These filters are known for their reliability, as well as for their collector arms, which feature a larger diameter for greater filtering surface. Fitted with an AstralPool multiport valve with 6+1 positions for filter, backwash, rinse, recirculating, waste and closed. A patented system is used for opening and closing the cover, which eliminates the use of traditional screws. Sand filter, laminated with polyester / fibreglass resin. If you are after a high performance filtration for residential and small commercial pool then the Astral FG fibreglass pool filter should be your first choice. All aspects of the filter have been designed to match high performance pumps and enhance the pump performance, allowing faster filtration using less energy. AstralPools CA Media Filter is 100% designed and made in Australia from the most advanced injection moulding and assembly process of any filter. Engineered and designed for high strength, long life, optimal flow rates and easy installation and service the CA Media filter range provides the best value for money filter range which is designed for tough Australian conditions. Glass filter media may look the same but Viron Active Glass Media has a negative electrical charge which conventional glass does not have. The negative charge applied during the manufacturing process lasts for the life of the media and attracts organic molecules improving the clarity of your pool water over sand or conventional glass. Reacting with chlorine or other sanitisers, the trapped organic material quickly oxidises and prevents the formation of film, bacteria and algae in the filter bed. The negative charge, called the Zeta Potential can be measured in millivolts and continues to work regardless of the pH of your pool water creating effective filtration at all times of the year. If you are after the latest technology in pool filters to keep your pool clear and clean, then look no further than the Hayward range. Offering simple to use operation and minimum maintenance make the Hayward range attractive without compromising on performance, value and dependability. All Hayward filters are engineered and designed to deliver reliable, all-weather performance with minimal care on today’s most demanding installations. Have questions about of range of filtration options from Hayward? Contact your nearest Poolwerx for an obligation-free quote. Incorporating the many advanced features of Hayward ProSeries™, the ProSeries™ Plus side mounted valve series satisfies the requirements of the most demanding installations, including pools installed with in-floor cleaning systems, commercial spas, fountains or solar heating systems. It’s spherical tank design evenly distributes the high pressure and stress associated with these applications, resulting in greater strength and longer life. When you invest in a swimming pool, you want to ensure the filter you use is going to give your pool the cleanest and healthiest swimming water for you and your family. With unique engineering and design, Insnrg pool filters and media are a reliable, durable and energy efficient option for any swimming pool. Have questions about of range of filtration options from Insnrg? Contact your nearest Poolwerx for an obligation-free quote. Insnrg’s Ci Cartridge filter boasts a unique weir system which saves time on regular cleaning and maintenance. The system minimises the disturbance of accumulated debris, meaning less work for the lucky owner! The Ci Cartridge Filter’s high strength build is engineered to withstand high pressures and provide excellent durability. With its’ easy to open lid and leak proof sealing, the Ci Cartridge Filter is a fantastic choice for any pool owner. With an Insnrg Li Cartridge and Di Filter, you’ll most likely only need to clean your filter once a year! Offering the perfect combination of particle removal and reduced maintenance, the Li Cartridge and Di Filter will ensure your pool remains crystal clear and healthy. With a larger filter tank, the Li Cartridge and Di Filter enables you to operate it at a lower speed and still get the same flow rate throughout the system. This saves you money and time! Natural sand filters have been a highly popular and effective filtration method for years. As water flows through the system, sand collects debris and other harmful particles leaving your water sparkling. Insnrg Mi Sand and Media Filters are easy to operate and will ensure your pool stays healthy all year round. 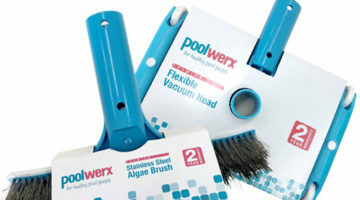 Your local Poolwerx can provide you with all the details you need. Your local technician can help you choose the right pool filter for your pool and talk to you about specifics like price, installation cost and more.